The distribution of my Group 2 contribution to BAO Edition 4 is complete and copies are now in the hands (collections?) of those in my group. 41: It's beginning to hurt takes as its starting point the possibility that one of Sarah Bodman's stories has been recovered from its place of interment in a Danish forest and subsequently offered for sale by a London bookseller. 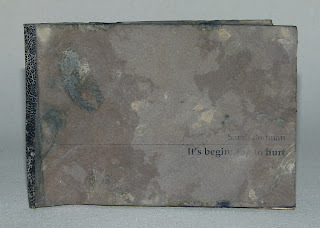 The work is housed in a simple drop side box and consists of a colophon, ephemera associated with the sale of the book and the book itself - much distressed with significant staining and water damage and evidence of insect attack. For those who might be interested, more photographs and details can be found here. The work is intended as a reflection on the hurt experienced by artists when their work is appropriated by others and used, often for profit, without consent and in a manner contrary to the artists' intentions. Hello Terrence. You won't know who I am (Susan Bowers) but I have had the absolute pleasure of holding, unwrapping and pouring over your truly beautiful book - 41. It's Beginning to Hurt! My friend Fiona Dempster and I shared a day last week where we brought along various artist's book we own, we examined them closely and talked about them endlessly. Without a doubt your book is the one that entranced us both the most. I loved all the nuances in your gorgeously bound book - all the little pockets of information which added different dimensions to the book. Gives me goose bumps really and I am so envious of Fiona owning one of these books. At least I can visit it! Hello Susan and welcome to BEMBindery. Delighted that you enjoyed the book. I'm about to start work on my second title for BAO Edition 4, which should be on its way to Fiona in a couple of months.